I had this big basket of strawberries that we picked up from a local farm and although the kids love them, I wanted to try something different than the regular things. 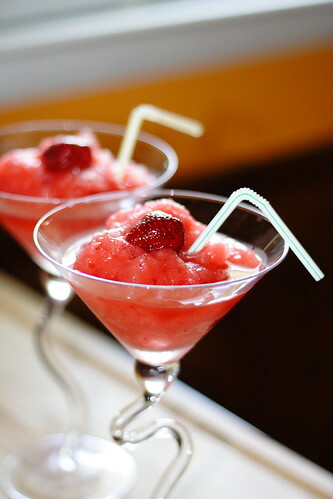 So, I came up with my version of Strawberry Daiquiri which both my daughter and I enjoyed very much in this hot day! - fresh strawberries, lemon zest and pieces, straws, little umbrellas etc. 1. Wash thoroughly the strawberries and remove the leaves. 2. Place whole in a large bowl and add the sugar on top. Stir once and leave them overnight ( or for a couple of hours) in the refrigerator. 3. 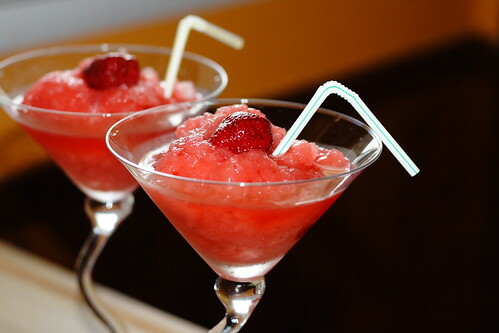 The next day combine the strawberries, lemon juice and ice in a blender. Blend until it has the consistency of a slushy. Serve immediately in martini glasses! *Note: You can rub the edge of the glasses with lemon and dip it in sugar for a greater effect. Ponyo's 3 minute noodles recipe!